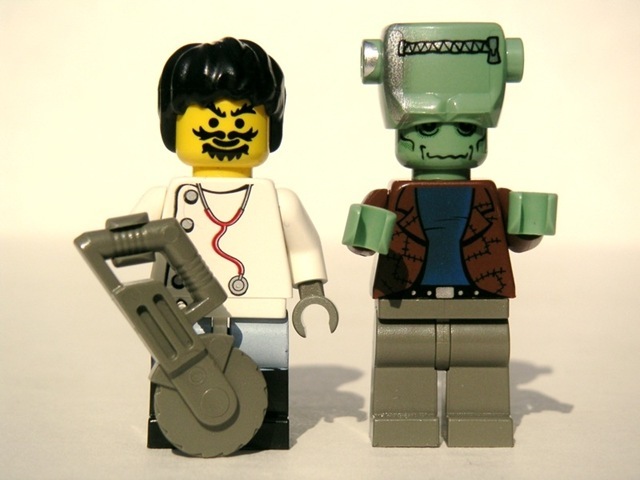 I wonder what Mary Shelley would have made of Frankenstein – The Musical ? For a book that was (a) all but ignored and (b) panned on its first publication, Frankenstein is proving remarkably resilient. While it’s true that hardly any of the spin-offs which have popped up over the last 180-odd years bear more than a passing resemblance to Mary Shelley’s novel, that’s not the point. The point is she created something that galloped off madly in all directions totally out of her control – and is still galloping to this day. Mel Brooks’ stage production of his and Gene Wilder’s iconic take on the theme – Young Frankenstein – is currently running on Broadway and gearing up for a US tour in 2009. The old warhorse is showing no signs of running out of steam. If you were to walk into any school, pub, nightclub or supermarket and ask people to describe ‘Frankenstein’ to you, it’s odds on he’ll have a flat head, a natty pair of electrodes through his neck and look remarkably like Boris Karloff, because the vast majority of people think of ‘Frankenstein’ as being the creation not the creator. The popular idea of the monster’s appearance is, of course, courtesy of James Whale and Universal Studios, but Frankie-mania had set in long before then. There had been no fewer than 15 stage interpretations by 1826, and by the time the first screen adaptation came to us in 1910, any resemblance to Mary Shelley’s masterpiece was completely accidental. The 1910 film version was 12 minutes long and silent, of course. It starred the perfectly splendid (if wildly unsubtle) Charles Stanton Ogle as the monster, emerging from a vat of chemicals and looking a bit the worse for wear. 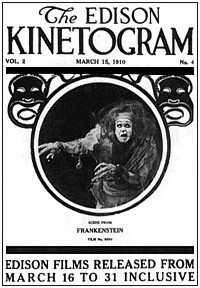 It was in 1931, however, that the iconic image of ‘Frankenstein’ was carved so indelibly into our psyches … by the English actor William Pratt – stage name Boris Karloff. The Universal Studios’ version owed far more to the preceding stage adaptations than it did to the novel. In fact, it’s entirely possible that the only person involved with the film who’d actually READ the book was Karloff himself – an intelligent, thoughtful and softly-spoken actor who deserved far better material than he was ever offered. From then on in, it was pretty much “Mary Shelley? Who she?”. Open season was declared and everyone had a go … from Hammer Films to Andy Warhol. Yes – Andy Warhol . It was called Flesh for Frankenstein – and you have to see it to believe it. Udo Kier at the top of his not inconsiderable camp form; Warhol regular Joe Dallesandro not troubling the costume department much on account of seldom wearing any clothes, and a script that was apparently written like a game of ‘Consequences’. There’s one scene where Baron Frankenstein opens up the abdomen of his (voluptuous, blonde, female) creation and … well … no, I really can’t go on – I’d probably get the entire site closed down. Let’s just say it gives a whole new dimension to the term ‘necrophilia’ and leave it at that. And how about Frankenhooker? That’s the one about the guy who rebuilds his dead girlfriend by blowing up prostitutes and sticking the bits back together. Honestly. There HAVE been some notable attempts to do justice to the novel, but they’ve been pretty few and far between. The 1972 made-for-TV movie Frankenstein: The True Story fielded a creation who was educated, articulate and cute (at least until his face fell apart) … in the shape of Michael Sarrazin; and then there was Calvin Floyd’s slightly odd 1976 version Terror of Frankenstein. It was an Irish-Swedish co-production which, although mostly faithful to the original where it actually coincided with it, was also pedestrian in the extreme. It did, at least have an articulate monster. Unfortunately, he articulated with a thick Swedish accent. Heaven alone knows where Victor found the larynx. It was Kenneth Branagh’s turn in 1994, with Robert de Niro turning in a more than creditable performance as the creature. But Branagh – like many before him – couldn’t resist the temptation to try and ‘improve’ on the novel, and the end result was a classic curate’s egg. It didn’t make you want to throw things at the screen, but you knew it could have been so much better. Then, in 2004, Hallmark Entertainment – of all people – pulled one out of the bag when everyone was looking the other way. Their 4-part mini-series, fielding William Hurt and Donald Sutherland among others was really rather good. How did that happen? Well, for one thing, director Kevin Connor trusted his source material and for another, the mini-series format allowed him to do justice to it without hacking the original narrative to bits. It is probably rather telling, however, that the two most successful spin-offs EVER after Universal’s 1931 film version were both gleefully iconoclastic parodies, and not parodies of the novel, either – but of the whole genre. Young Frankenstein – a film that became a stage musical – and The Rocky Horror Show – a stage musical that became a film – were both the products of very sharp minds indeed (Gene Wilder/Mel Brooks and Richard O’Brien respectively). They paid affectionate homage to their parents and originals, but at the same time booted them firmly into touch and proceeded to give the entire Franken-thing a much-needed shot in the arm. The latter show, which has since taken on a whole new and surreal life of its own, first saw the light of day 35 years ago in The Theatre Upstairs in Sloane Square, and it owes virtually NOTHING to the novel aside from the basic premise of ‘making a man’, but then, that means it’s in excellent company. I can’t even begin to imagine what Mary Shelley would have made of it, but I’m fairly certain that the thought of rhyming ‘runes’ with ‘prunes’ would never have crossed husband Percy’s mind. The above only skims the surface of the subject. Exploring it in the depth it actually deserves would have required several weeks of my life and produced something of the length of ‘The Divine Comedy’. Please feel free to pitch in and nominate your own favourites (or otherwise …). Brian Aldiss’s ‘Frankenstein Unbound’, anyone? ‘The Addams Family’? ‘Blade Runner’? Really enjoyed that, M. Love the lego Frankie particularly. Yeah, that Lego pair is amusing & unexpected. I hadn’t realized there was so many different variations of film and book versions, and so few which gets it right. 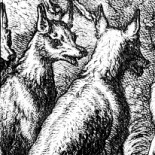 Don’t forget Frankenweinie, an early Tim Burton short film about a put together daschund.Or The Bride, Sting’s venture into the story. Frankenweinie. That one by-passed me completely, somehow. Blade Runner. Never thought of that as being a Frankenstein story but I suppose you have a point. In the end Roy Batty was more human than his creators wasn’t he? 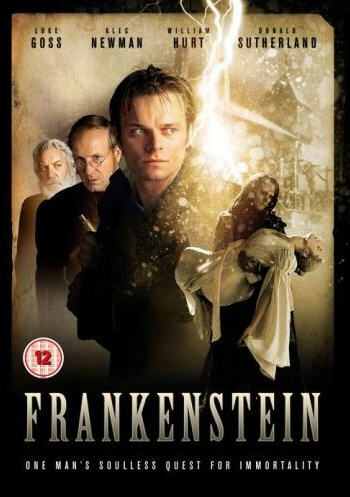 The film makers helped breed the idea that Frankenstein was creation not the creator didn’t they? With their follow-up films. Bride of Frankenstein, and all those dreadful Frankenstein Meets Wolfman type things. What an entertaining piece, Moira. Amazing to think that Mary Shelley’s book inspired all of that, and more…however questionable some of it is – what fun! This entry was posted on December 5, 2008 by Moira in Entries by Moira, Special Features and tagged Andy Warhol, Boris Karloff, Frankenstein, Hammer Films, Mel Brooks, Rocky Horror, Universal Studios, Young Frankenstein.